This week I haven’t been feeling very well. I don’t have cold symptoms; I don’t really have any symptoms to be honest. I just feel not quite right. I have some theories about this. The family was hit by a pretty nasty stomach flu about a month ago and frankly, I’m not sure I’ve fully recovered. My appetite is off and my energy level is incredibly low. Given the severity of the flu, I’m pretty sure any good flora in my digestive system was totally wiped out. Follow this with a week of eating out, two birthdays, a week of PMS-ing (I crave chocolate cake when I PMS – and typically give in) and Valentine’s day, and I have pretty much destroyed my gut. I have a couple of tactics. 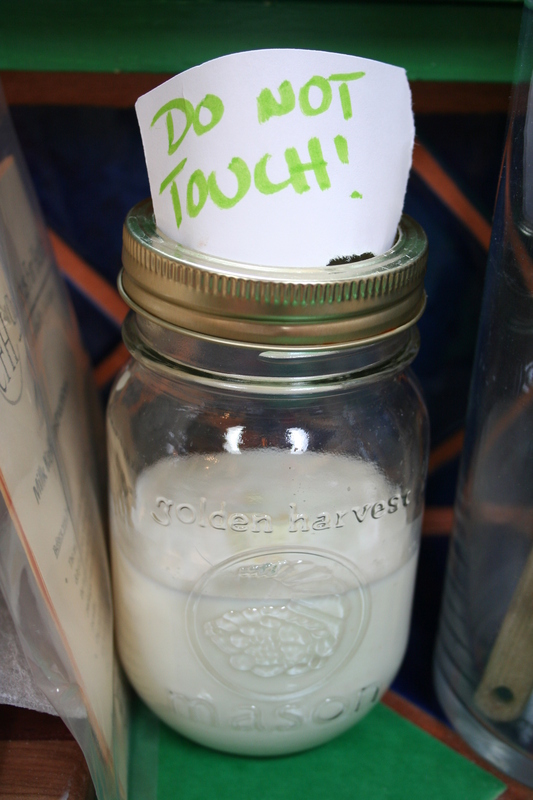 First I will be using my home made raw milk kefir as a tonic to restore all those good bacteria that may or may not be absent. Even though my goat is nearly dried off, she is giving me enough milk still to make a few cups of tea a day and about 1 cup of kefir with each milking. The other big gun I have? Congee. Now a good many of you may not be familiar with congee. It is something I was introduced to during my training in TCM (Traditional Chinese Medicine) and again when I traveled to China. It is, in my opinion, a delicious porridge made of long cooked rice and sometimes a combination of rice and millet. The grains are cooked for upwards of twelve hours (basically overnight) until they develop a gelatinous consistency. Typically the ration of rice to water is somewhere between 1:6 and 1:8, but sometimes I go up to 1:10 in order to get a soupy quality. It is occaisionally amended with protein in the form of eggs or pork, and even has veggies mixed in from time to time. I generally prefer it with a fried egg and this is how I ate it this morning. The idea of congee is best understood as part of the TCM theory about the digestive system in general. Chinese Medicine envisions the digestive system as akin to a campfire. The idea is that at night, while asleep, you allow the fire to burn down to embers due to lack of fuel. When you wake up in the morning, you want to put the right kind of fuel on your fire to keep it going, i.e. something that won’t put the embers out! If you think of food as fuel, you can imagine that the type of fuel you’d want to put on low embers would be kindling…something that will catch quickly and bring the fire up to flame. Think of congee as kindling. If you’ve ever eaten a bowl of oatmeal only to be hungry a few hours later, you can understand the analogy. It is easily digested and turns efficiently into energy. Basically what I am attempting to do is stoke my digestive fire. I am hoping that the combination of congee and pro-biotics will jump start my system and will allow me to fully recover from the combination of stomach flu and overindulgence! It also tastes delicious…especially with an egg. The recipe I used is very basic, but I have included it anyway. I have experimented with different grains such as amaranth or barley, and have even added beans just to mix it up but to be honest, I like the basic the best. Combine the grains and the water in a crock pot and put on your lowest setting overnight. Serve warm with a fried egg or anything else you might think tastes good! This post has been my contribution to Real Food Wednesday, hosted this week by Cheeseslave. 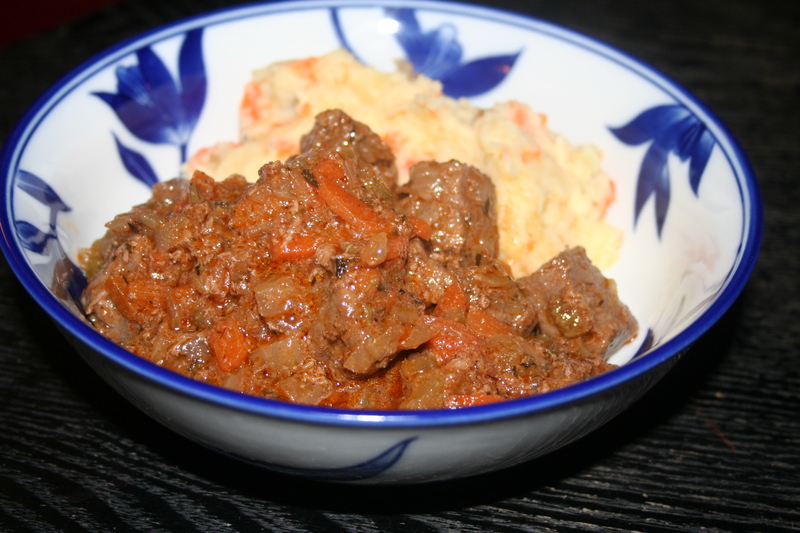 So the other night I was looking once again at the beef in my freezer wondering what I could do with all that stew meat that wouldn’t be exactly like everything else I have ever done with stew meat. To be completely honest with you, inspiration did not strike until I was halfway through the process, but oh! Did it strike hard! The use of the pressure cooker is a result of the fact that I was procrastinating and didn’t start dinner until about 40 minutes before we were scheduled to eat. This stew could probably be cooked in a stock pot or crock pot, but the recipe would have to be adjusted to accommodate the longer cooking time. My pressure cooking is one of my favorite tools here in the kitchen. It makes cooking beans a breeze and helps with a variety of meat dishes. In addition to the beef, I had planned on adding carrots and potatoes to the stew halfway through the cooking, so I had them all cut up on the counter next to the pot. When I tasted the beef portion, however, I decided against doing so. Instead I simply boiled them up and served them on the side with a strong dose of butter, heavy cream and salt. I love fat…but that’s a different post! Here is the recipe! Place the meat in a bowl and add the black pepper – I am guessing on the quantity because I basically just peppered the meat until it looked covered enough. I like the flavor of pepper in my stews, so I suspect I put in quite a bit. Set the meat aside for a minute at room temperature and heat your oil. I used a pressure cooker because I started dinner late and it is a great way to tenderize meat and cook veggies really quickly. You could use a different method, but you would have to adjust the liquid to compensate for the longer cooking time – probably up to two cups. Heat the olive oil and butter in the pressure cooker over medium high heat until the butter has started to brown a bit then put in the peppered meat. Avert your eyes and use a long wooden spoon to stir the meat until it is well browned, about 3 – 5 minutes. Pour the meat and all juices back into the bowl and put the pot back on the heat. Lower it to medium low, then add your chopped onions, celery and carrots. You want to “sweat” these veggies, not sautee them. Cook them this way, avoiding browning, until the onions are translucent and the carrots are soft, about 5 – 7 minutes. Add the beef and all accumulated juices back into the pot, along with the cognac, tomato paste and water. Stir well so the tomato paste dissolves and bring to a simmer. Add the crushed thyme and fennel seeds and your salt (I like a lot of salt, so simply salt to your taste). Place the lid on your pressure cooker and set it to the correct setting for your altitude. Once the pot has pressurized, cook for 10 minutes (so quick!). Check the stew at this point and make sure the meat is tender enough and there is still liquid. If you want it to go a bit longer and the liquid is sufficient, go ahead. I was happy with the results after this amount of time. What you end up with is an incredibly savory, rich stew with a thick sauce and tender meat. Serve it poured over mashed potatoes (and carrots!) and you have a really quick, hearty meal for these snowy, cold February nights. This post has been my submission to Kelly the Kitchen Kop’s Real Food Wednesday blog carnival. I finally got my Kefir grains from Cultures for Health and I have been spending the last few days acclimating them to my raw goats milk. I am very excited about these little bundles of bacteria and am hopeful to be able to make an actual batch of kefir next week. For those of you unfamiliar with the stuff, kefir is a fermented milk beverage. It has a sour flavor similar to yogurt, but the texture is very different allowing you to drink it. Said to originate in Russia and the Caucasus, kefir has many health benefits, not the least of which the introduction of beneficial bacteria to the intestinal floura. It is for this reason alone that I have been wanting to start my own kefir culture. More information about the history (real and legendary) and the health benefits of kefir can be found here. 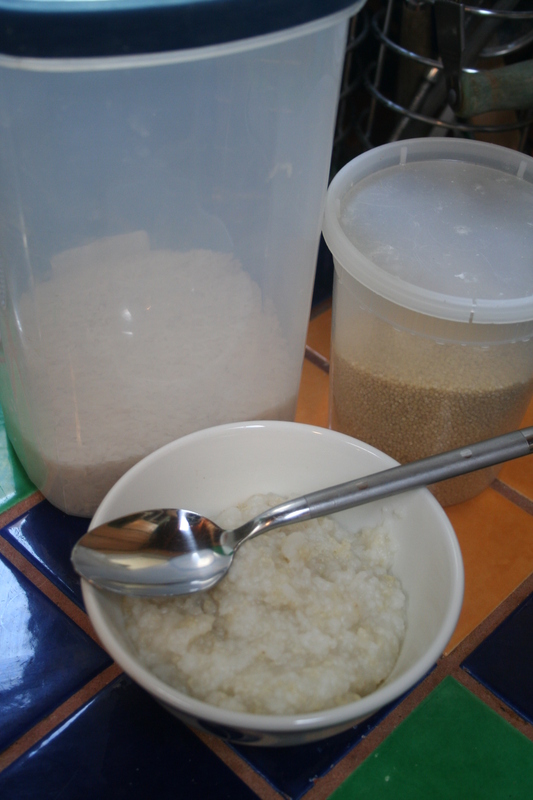 The grains themselves came packed in a small amount of powdered milk which I just added to my raw goats milk. The instructions said to let the grains sit at room temperature in the milk for 24 hours, at which point you strain them and add them to fresh milk and repeat the process. Apparently in 4 – 7 days you should have a product that smells slightly sour, possibly yeasty, and not at all off. Today is day 5 for me and I suspect I may need another day simply because my milk is raw and the kefir is working with a much higher load of existing bacteria than if I were using pasteurized milk. It also looks as though my grains are already multiplying! I am very excited about this for a variety of reasons. First, it means that they are healthy and working, secondly it means I can share them if people are interested! Very exciting indeed. With that success in mind, one of the things I have struggled with is whether to rinse the kefir grains when I change the milk, as there is nothing about this on the instructions from Cultures for Health. I have simply been adding any accumulated cream/curd back into the fresh milk, rather than rinse the cultures with water. It turns out this is absolutely right! I was doing some research and found a great site with a ton of information about kefir grains. Not only did it clarify the process a bit for me, but it also provides some ideas about how to store the grains if they are not being used, as well as giving a few ideas on kefir variations (such as refrigerator kefir or a double fermentation method). The irony of all of this is of course it is very near the end of milking season and I am running extremely low on my goat milk. Goats typically only lactate for 9 months and I am pushing the issue with my Nubian so that I can have milk until my other girl delivers (expected late March). I am milking my girl every other day in an effort to dry her off slowly and as a result, only have about a quart every two days. Given that I have had to use 2 cups from each milking for the kefir I don’t have a lot left over! Not the best planning in the world! 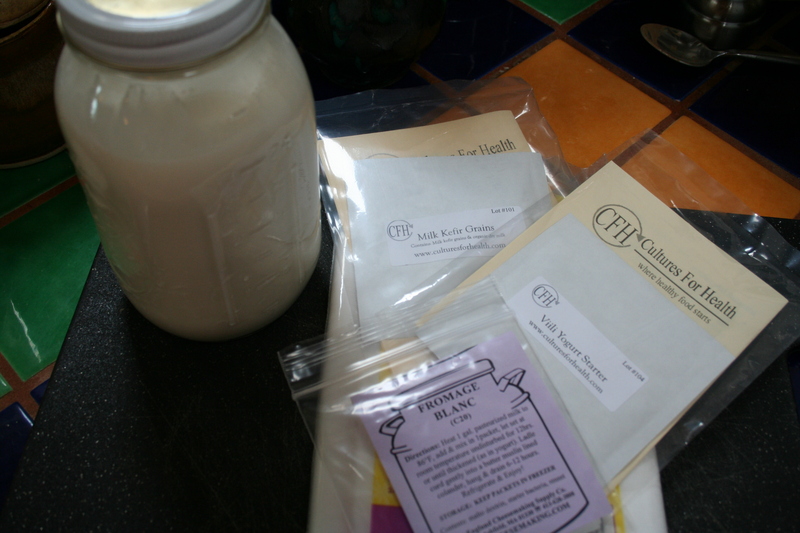 In either case, I am hopeful that by this weekend I will have a nice batch of birthday kefir (my B-day is Friday!) and when I have managed to get a successful batch, I will post about it here. Until then, Happy Eating…and drinking! This post has been my contribution to Real Food Wednesday’s, hosted this week by Cheeseslave. One of my old standby’s for breakfast is pancakes. They are remarkably simple and incredibly versatile. You can use a multitude of different flours, a variety of dairy products, and you can add almost anything to the batter. In fact, I regularly disguise fruits and vegetables as pancakes in order to get my two year old to eat them – my favorite is pumpkin season…mmmm, so good! But that is another post. 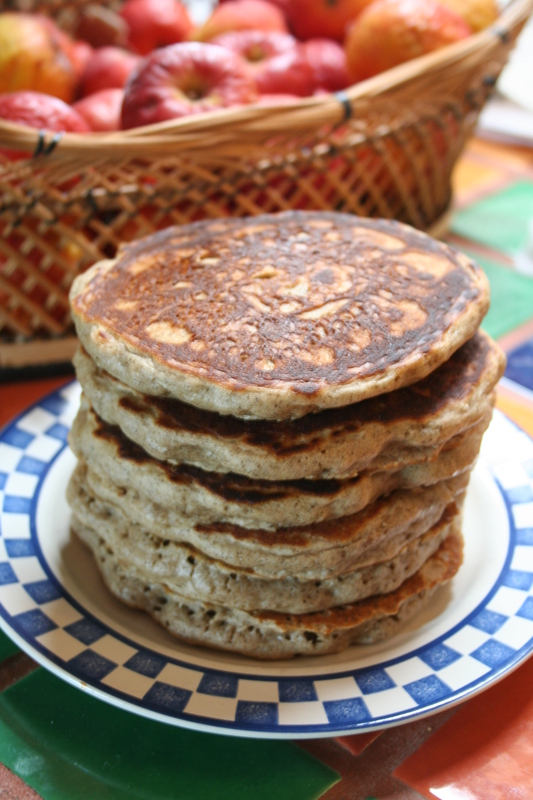 In fact, pancake batter is one of the few grain recipes where I regularly remember to soak my flour before using it. The reason is simple: You can make pancake batter the night before and refrigerate it until the morning. Not only does this make the whole process much quicker in the mornings (helpful when you have a very hungry toddler demanding pancakes) but it also allows the batter to sit in buttermilk (or yogurt, or kefir) for 12 hours before cooking. This time of year, with the pumpkin mostly gone, I tend to start using my applesauce as the fruit. Homemade, with very little sugar, it adds just enough sweetness to the batter. My basic recipe comes from The Joy, but it has been so long I have multiple modifications. For the apple sauce buckwheat version, the recipe is below. As for others, as long as you stick to the basic wet/dry ratio (i.e. 1.5 c flour to 1.5 c dairy), you can experiment as much as you like! I tend to use at least 2/3 c of unbleached all purpose flour however, as otherwise the pancakes can get dry. Experiment though, and see what you like! Adding honey to a pure whole wheat batter, for example, would compensate. Generally, however, I never add more than 1/3 c of pureed fruit or veggies, otherwise the texture is off. *I have dairy goats and make my own kefir. I have found that I like the combination above. You can always use all buttermilk or kefir or yogurt, however if you do this you will need to adjust your leavening to 1 tsp powder and 1/2 tsp soda to compensate for the higher acidity. You, of course, can also use all milk, but then any benefit you would get from soaking the flour would be lost. Mix the dry ingredients together and then add the dairy. Stir until fairly well mixed, cover and refrigerate for 12 hours. This will lead to a rather sticky mess, to be honest, but trust me! It will work. Do not forget to cover, however, otherwise a nasty skin will develop. The following morning, go ahead and combine the eggs, applesauce, melted butter and vanilla, if using, then add to the soaked flour mixture. Stir until just mixed – any over mixing at this point will lead to very heavy pancakes. Heat a griddle to medium low and grease it. I used to use canola oil for this, but have since experimented with other things. Butter does not work well! You need some other oil, such as sunflower or safflower, or if you want the flavor of it, coconut oil. I do not like olive oil, even though it has a nice high smoke point, simply because the flavor is too obvious for me. Experiment until you find one that works for you. What you want to do is put about a TBSP of oil in the pan and use a paper towel as a grease mop. Lightly brush the oil around the pan, being careful not to burn yourself, and set the now greasy paper towel aside for the next one. Ladle in about 1/3 – 1/2 c of batter and cook until the edges start to get glossy and the center bubbles, then flip. Re-grease your pan with the paper towel before starting another pancake. Load them up with more grass fed butter and some organic grade B maple syrup and enjoy! This post has been my contribution to Kelly the Kitchen Kop’s Real Food Wednesday blog carnival.